Earlier today, the Southern California Association of Governments unanimously passed the 2015-2035 Long Range Transportation Plan/Sustainable Communities Strategy to guide local transportation planning and investment in the six county region SCAG oversees. While past SCAG plans have focused on building out the highway network, this plan conforms to new state laws requiring that transportation planning leads to a reduction in greenhouse gas and focuses much more on transit expansion. 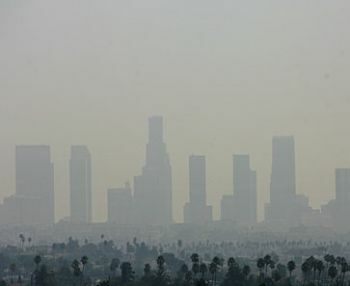 In 2008, Governor Arnold Schwarzenegger signed SB 375 into law which required that regional land use and transportation plans bring about measurable changes in Greenhouse Gas emissions. The first regional plan passed under this law was by the San Diego Association of Governments (SANDAG) and is now being challenged in court for placing too much emphasis on highway expansion, albeit in the form of high occupancy toll lanes. More on the plan’s impact can be found at the NRDC Switchboard, where Amanda Eaken, the NRDC’s Director of Sustainable communities broke down the plan in advance of today’s meeting. Eaken herself was thrilled with today’s unanimous action. The $6.7 billion mentioned above for walking and bicycling is less than one percent of the budget despite pedestrians and cyclists accounting for 25% of traffic fatalities. A recent study by the L.A. County Department of Public Health found the need for bicycle and pedestrian funding to be $42 billion over the life of the SCAG plan. SCAG is the nation’s largest metropolitan planning organization, representing six counties, 191 cities and more than 18 million residents. you making this sound pretty good Damien…. is it? Best weather I care to differ. But this is good news. My biggest problem with the plan is increased housing density.. even if located near transit. More people will equal more cars. PERIOD. Sure, folks living in TOD my drive LESS than others… but they will still drive. Transit density is not high enough to make getting to most places feasible for MOST people. It’s very simple: more people equals more cars, more pollution, more congestion, bigger crowds, lower quality of life. it’s a step in the right direction, but woefully inadequate. @a547cf7fdf0ec9006b87813a3ee3fe8d:disqus : never said lack of density would “decrease” the number of people living here.. but I do assert that it won’t INCREASE the number of people living here. Your assertion that more people will live in the city, thereby reducing air pollution is simplistic and naive. Even the people that live “in” the city will go places not easily accessible by transit and will use their car. My mom works and lives in the urban core and still puts 6K miles on her car each year. I have a friend who lives downtown because it’s hip, but works in La Habra (long commute). More people equals more miles. PERIOD. Forget my anecdotal evidence. Look at San Diego. I was living there when they pitched the dense high rise condo idea to the voters as a way to ease traffic into downtown on the south 5 and south 15. Everyone will live and work downtown and the freeways will be less crowded. What happened? Well, the southbound freeways were as clogged as they ever were, and the northbound side… which used to be nearly vacant during rush hour, is now clogged too.. with people living downtown and working in north county.